Colombo Engineering, a leading ship repair company in Sri Lanka has declined an offer to invest in a Ship repair facility in Doha and Lebanon. According to Chairman Colombo Shipping, Kiran Atapattu, the offers were made last year. "I have the investments and a foreign partner for the project. However I am not in a position to pursue these proposals since there is no competent staff to recruit for the project," he said. He said that this project needs highly qualified skilled labour and sadly this manpower is not available in Sri Lanka. "I could hire staff from the Gulf of India. But the present financial position in my company will not be able to pay the high wages I would have to pay," he said. Attapattu said that there is no proper training school or a higher education institution in this field to feed in competent staff to meet my requirement. "This is an area that needs urgent attention," he said. He said that the local ship building industry can be turned around to be Sri Lanka's number one forex earner and a proper marketing plan is needed to attract shipping companies to bring ship repair jobs to us. He said that since Sri Lanka is located in the centre of the East and West shipping route, attracting the shipping companies to place more ship repair orders would not be a difficult task. "Many countries are already doing this and its high time to develops an aggressive business proposal to promote the shipping sector," he said. He said that whenever a ship anchors in the Port for repairs she has to stay for five days and during their stay the crew and passengers would make purchases which would bring more revenue and especially it would stimulate the cottage industry. "They make purchases to the value of millions and these arguers well for the country," he said. When Sri Lanka gained independence in 1948, the country's trade was dominated by foreign shipping lines, most of which were members of International Freight/Shipping Conferences. Shipping conferences are cartels, which are closed-door meetings of shipping companies working on the same routes and which jointly decide common tariff rates and terminal handling charges. As a result, freight rates are generally high and unvarying. Customers then have no option but to pay what is demanded. The Sri Lanka government is keenly aware of this fact, decided to create a Sri Lankan fleet to assist the country's trade. Accordingly the Ceylon Shipping Corporation (CSC) was established in June 6, 1971 by a Special Act of Parliament. The CSC along with the Central Freight Bureau of Sri Lanka (CFB) which was established a few months later, radically changed Sri Lanka's shipping during the late 1970s and 1980s. The CSC built up a fleet of 16 vessels whilst chartering other ships when required and played a major pioneering role in containerising the shipping trade from South Asia. Its promotional freight rates greatly supported domestic exporters and provided the necessary stimulus to the nation's export drive. Additionally, the Corporation provided international training to its crew and shore staff, many of whom are now serving with distinction with local and international shipping companies. In 1990, the government liberalised shipping policies to encourage more shipping lines to call Colombo with a view to making it the 'Hub' port of the region. As a relatively unknown fledgling service, CSC could not complete with the new giant mega lines that were calling at Colombo. Realising the futility of competing with the massive international lines, the national carrier thereafter rationalised its services by concentrating on chartering its remaining vessels - and broke new ground in the areas of NVOCC operations, clearing and forwarding. Through prudent fiscal management, CSCL systematically repaid the loans incurred through purchasing of vessels. With the Corporation financially viable, the new management who took over the CSCL last year is endeavouring to build anew the CSCL fleet and marine services. This will ensure that when the Corporation reaches its 4th decade of service to nation, Sri Lanka will once again see the "National Carrier" actively entering the international shipping arena and serving the country's trade. Neil Marine built one 14 mtr Pilot Launch "Merle" and a 14 mtr passenger launch "Marianne" for the Ports Authority in Seychelles. These two boats were shipped on board "Praslin Wave" which was specially chartered to pick up these boats from Colombo harbour. They were exclusively custom built at the Neil Marine boat yard in Negombo and the yard was able to deliver the boats on time to the satisfaction of the Seychelles Ports Authority. These two boats will be ceremonially launched on the June 16, the National Day of Seychelles in the capital of Mahe. Prior to the delivery of the vessels their Engineers flew in to Sri Lanka and sea trials were conducted successfully between Negombo and Beruwela. Neil Marine has supplied a large number of boats in the past to Seychelles and the vessels are well-known in Seychelles for their performance. The vessels are powered with twin Yamaha Diesel marine inboard Engines of 400 HP capacity each and were able to have a speed of 23 knots per hour. They are also installed with radar, SSB radio, navigational compass, life rafts and all other passenger safety equipment. 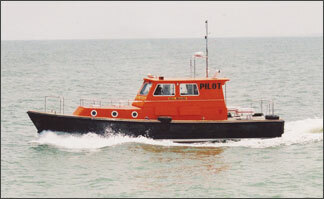 The pilot launch has seating capacity for 23 and the passenger launch has seating capacity for 45. "Neil Marine is proud to announce the execution of this order," said a spokesman. Production: Viksund Asia was established as a BOI Company in Sri Lanka for the production of small and middle size pleasure boats which were exported. 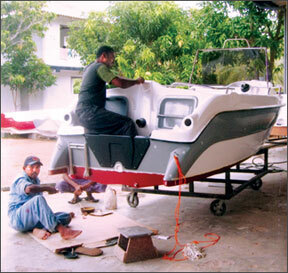 In 2004 Vikshund Design and Model Centre was established with BOI privileges for developing and designing of boat moulds. Today Viksund Design and Model Centre has 100 to 110 well trained Sri Lankan employees and produces neraly 500 boats per year for exports. Two workers seen in busy giving final touches to a boat.